What if, instead of thousands of people driving going to and from the waterfront each day, we had thousands of people walking, cycling, and using transit? At yesterday's General Issues Committee meeting, Councillors discussed the proposal of a major new mixed-use waterfront development (read the report [PDF] and the presentation [PDF]) on Piers 5-8. It would cost the City around $40 million to get the land development ready, but the new development would bring in $7.5 million in new annual property tax revenue. During the discussion, Councillor Lloyd Ferguson expressed concern about traffic to and from the waterfront. In response, Mayor Bob Bratina suggested converting Wellington Street North and Victoria Avenue North from their current configuration as four-lane one-way streets to two-way. Right now, Victoria Avenue north of Main carries just 9,000 cars per day - enough traffic to justify one lane, not four. Wellington carries 12,000 per day. 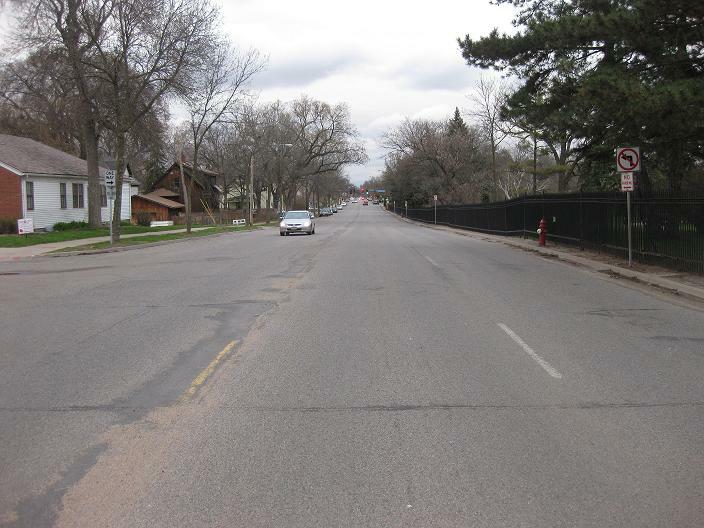 Here is a street in Minneapolis that carries just over 12,000 per day. 36th Street West is a direct route between Highway 35W and Lake Calhoun. It's currently four lanes but the City plans to convert it into a complete street with a bikeway and pedestrian path. Cities that are not investing in physically separated bike lanes are already being left behind as North America scrambles to catch up after decades of ignoring cycling as a viable transportation mode and telling cyclists to ride in mixed traffic - something almost no one is willing to do. Here's the cross-section for the 36th Street West plan. 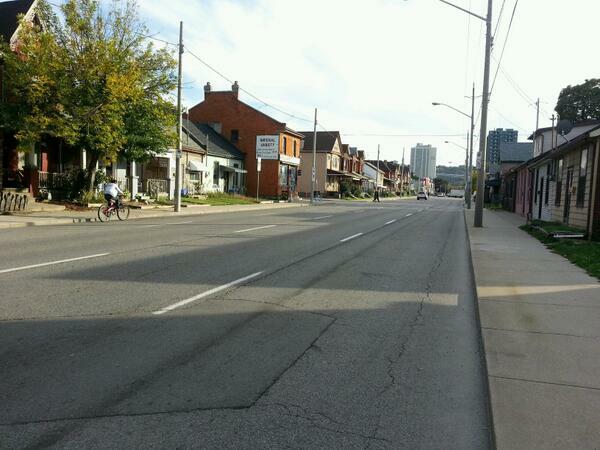 This is a solid template for several overbuilt four-lane one-ways in Hamilton. So how would the model for 36th Street West work here? Victoria and Wellington already have sidewalks so we don't need the walking path. Instead, we could create a boulevard on each sidewalk with a continuous row of street trees to help boost the city's tree canopy. Voila: an old urban neighbourhood gains a tremendous boost in its quality of life, mroe balanced transportation options, improved safety for children, cleaner and greener air, and automobile traffic will still flow smoothly since each street will still have two driving lanes. Drivers will actually have more flexibility to get to local destinations because they can drive in either direction on either street. Wellington: Full lane on the west side of Wellington used for two-way protected cycle track. This continues up the western lane of the Claremont Access and uses one of the two lanes that cut along the Mtn Brow to connect to West 5th. At West 5th, Fennell and Garth there is ample space to put this cycle track off-road on the 'other' side of the sidewalk by using the large grassy areas that front St Joes, Mohawk College and Hillfiled Strathallen. Victoria: take the eastern lane of the Claremont, beginning at Inverness Avenue for two-way, protected cycle track all the way to Burlington Street. This cycle track can extend south on Victoria to Stinson (where bike lanes already exist), and between Stinson and Charlton bike lanes can be on either side of Victoria as it is two-way. 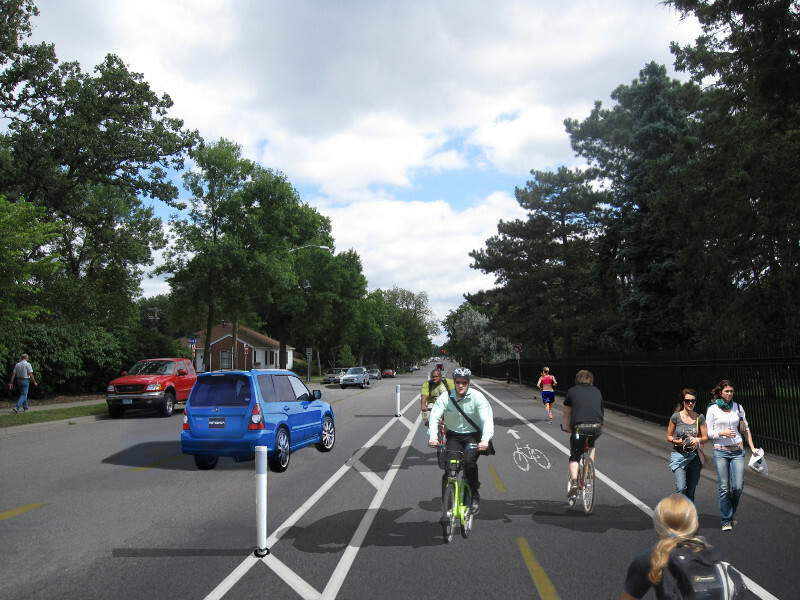 Charlton Avenue: extra road width from John to Wentworth would allow for bike lanes on either side of the roadway. Wentworth: four lane section from Charlton to Delaware can be reduced to two lanes with bike lanes on both sides and a pedestrian stoplight at the rail-trail. This concept would connect the huge student population at Mohawk to downtown Hamilton safely, and would connect with planned bike lanes on Hunter and Cannon. It would also connect with a network of proposed greenways on Bendamere and Cumberland/Rutherford. It would connect with the Escarpment Rail Trail, and it would connect with the Burlington Street/Ferguson Ave/Waterfront Trail. Mountain and central Hamilton residents would now have an enjoyable, safe cross-escarpment route that would allow them easy access to the downtown core, central Mountain and beautiful West Harbour. It also connects with the new multi-use path/bike lane on Burlington between Wellington and Parkdale. Right now many cyclists drive their cars with bikes down to Pier 8 to enjoy the ride around to Cootes Paradise. This network of bike lanes, using lanes we simply do not need, would allow them to do so safely from their own homes on the Mountain or Central City. A full lane on the Claremont Access has been closed for over a year and traffic still flows like a freeway. Let's think beyond Setting Sail and start to truly create a city where people can commute or enjoy exercise/leisure time on their bikes no matter where they live. Of course, most of this is not already specified in our Shifting Gears cycling plan, so staff will doubtless be inclined to recommend against it. This year, Shifting Gears is due for its five-year review. I hope Council decides to adopt the "routine accommodation" model of the recently approved Pedestrian Mobility Plan for cycling so we don't miss opportunities to build good cycling connections just because they're not already on the Shifting Gears map. A cycling network is only as good as its connectivity - it needs to connect where people are to where they want to go. Likewise, a bike route is only as safe as the most dangerous section along the route. As long as our bike network consists of fragments of painted bike lanes, shared traffic routes and big holes with no coverage, it will fail to draw the thousands and thousands of new riders who would flock to beautiful, continuous cycle tracks and greenways that knit the city together. Update: added Google Map of proposed bike routes. What a great idea! By connecting the mountain brow to the waterfront in this way, you showcase two of Hamilton's unique gems that most cities do not have, in a way that encourages students, many of whom are from out of town, to experience it in a fun and active way that also provides access to the downtown. Brilliant! This is what many, many other cities are doing, but few, if any, have such beautiful and unique geography to take advantage of. It's incredibly refreshing to hear Mayor Bratina actually proposing a two-way conversion instead of letting it die in council. A two-way conversion of Victoria/Wellington would be great for the neighorhood. Although I'm sure he didn't have bike-lanes in mind and just wanted a yellow line painted down the middle (both streets have a left-side parking lane so you wouldn't even need to do anything fancy to get the city's usual preferred TWINO solution). During some heavy underground work a couple of years ago, both Wellington and Victoria were each reduced to 1 lane (at different times). Rush-hour traffic was slow, but not unacceptable. Two-cycle wait at Barton, that's it. And this is a restriction that was worse than Ryan's proposal since there was only one northbound lane on one street instead of one on each (and likewise for southbound). A road diet on Wellington and Victoria would probably go a long way in getting trucks off Cannon and Main (Wentworth and Sherman still might work for them, though). I'm expecting the traffic people at City Hall to hate the idea though since they've got Ferguson as the fancy bike-route, and having one bike-friendly north/south street for the entire east side is plenty, thank you. I'm still disappointed Bratina didn't mention the other obvious failure in connecting the north-end: 1-way Bay Street. I know they hate converting half a paired street but it's not really paired with Queen. In the South it fails as a pair since it's not really connected to Beckett, and in the North it fails as a pair because Queen mostly just connects Westbound traffic from Cannon to King - the "pair" of Queen North is Main Street. Bay is the only continuous road in the area - Caroline ends at the school, Hess is stuck the same way as Bay, Park and MacNab end at Jackson Square. 2-way conversion of Bay Street would probably the single biggest boost to way-finding downtown you could do with a single street. The Clairmont is begging for a two-way bike lane. It's easily the single most absurdly over-built thing in the city. This kind of an idea should have been part of legacy projects connected to Cycling Championships. Easy, simple and brilliant use of space and existing infrastructure. I would love to see Wellington and Victoria calmed. Parks nearby will be far less dangerous and approachable! Four lanes of traffic? We have progressed from shift work scheduled traffic patterns. The 2015-16 budget will be here before you know it. WIll be interesting to see where sustainable transportation figures in. This news is absolutely amazing. Victoria and Wellington are 2 streets with so much potential. Victoria especially since it essentially marks the west entrance to Barton Village, an area that we all know needs love but has a bright future. Refreshing to say the least, this needs to happen! So when exactly did Mayor Bratina get replaced by an alien "pod person"? Or is he just trying to show that he is "progressive" and "hip" in the face of the upcoming municipal elections? Here is a video of a similar street in The Netherlands. Two lanes for cars and cycle paths. Wentworth St from Maine to Barton would stay one way? So, it's ok for the truck traffic that would normally go down Wellington to now go barreling down Wentworth? Who said Wentworth should stay one-way? This article focuses on Victoria and Wellington, but for years our general position is that all the one-way thoroughfares that torment lower city neighbourhoods should be converted to complete, two-way livable streets. "Wentworth: four lane section from Charlton to Delaware can be reduced to two lanes with bike lanes on both sides and a pedestrian stoplight at the rail-trail." Was just wondering(out loud) :) why only to there? absolutely the rest of Wentworth needs to be reconfigured. Perhaps just into a 1-lane each way cross-section such as is being proposed for the portion south of Delaware. No intent was made to suggest the northern part of it is fine. This main gist of this piece was to present very doable ideas that largely only require paint and barricades due to our overbuilt roads, and could be done sooner rather than later. Went worth from Barton to Burlington is two way. I think Dave Stevens the President of the North End Nieghbors is already working on this. He is Big on complete sts and 2 way conversions. he also worked on the Cannon st bike lanes. Want it done? SEND transportation planning manager Alan Kirkpatrick an email!